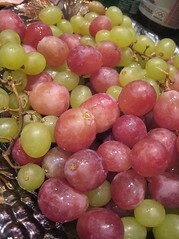 We're very happy and excited to have once again been chosen to participate in Foodbuzz's 24, 24, 24 blog event. We're especially excited as we are showcasing a part of our heritage, Philippine/Filipino cuisine. It's due in part to Robyn Eckhardt's wonderful writing on the Philippines and David Hagerman's wonderful photography -- on their blog, EatingAsia, and in the December 2008 issue of Saveur -- that we started to contemplate serving a Philippine-inspired dinner during the holidays. 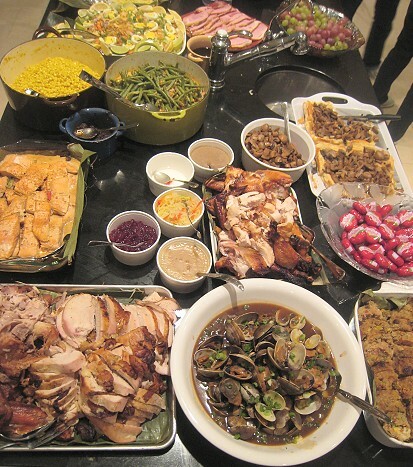 In all our years in Vancouver (almost 20 years), this year 2008 would be the first time that we are explicitly holding a feast evocative of the Christmas/Holiday feasts in the Philippines. 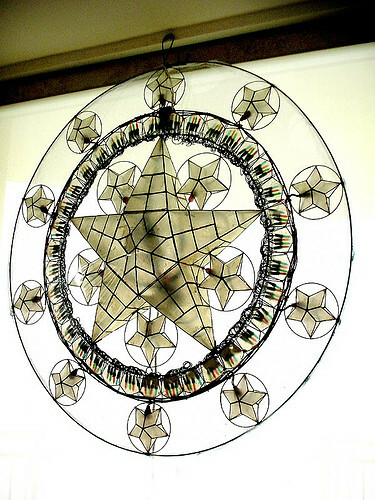 Our holiday theme this year is inspired by the parol. 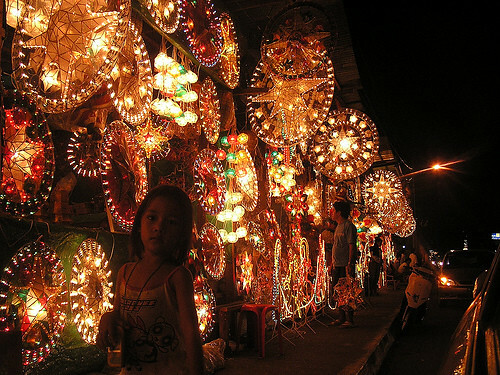 The parol is a traditional star-shaped Christmas lantern hung in homes and most establishments in the Philippines during the holiday season. 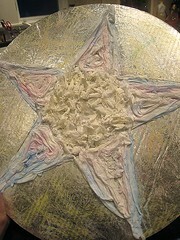 The parol evokes the Star of Bethelem, which guided the Magi towards the manger where the baby Jesus was born. Our menu includes traditional and perhaps not-so-traditional Filipino and Filipino-Chinese dishes, inspired by the star-shaped parol. In keeping with our parol theme, we tried to have either star-shaped ingredients, star-shaped finished products, or quintets or groups of five (for the five points of a star). Pineapple Soda with Star Anise Syrup & Pomegranate Ice "Stars"
Photographs and details about the food below, of course. In keeping with the parol theme, I had envisioned our home twinkling and glittering with parol lights. We attempted to purchase them, but they were quite hard to find here. We found a couple of small ones that cost more than $100 each! They were the ones made with capiz shells. But, at that cost, we couldn't justify buying even one. I thought, why not make our own? 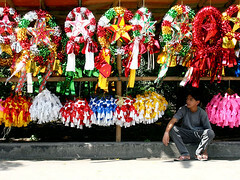 I'm talking about the more "traditional" parol made with sticks/wire and papel de hapon (a paper similar to tissue paper). I tried making this small one, but this was much harder than I anticipated. I can only get this far. 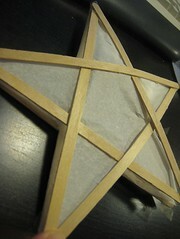 Then I thought, if not a real parol, then something star-shaped at least? 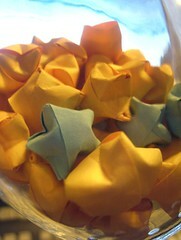 I made folded stars in hopes of filling a container with them. It was taking far too much time so I had to stop. Those stars in the image above could only fill 1/4 of a small 200mL bottle! 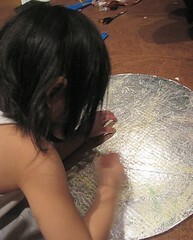 Finally, I came up with the brilliant idea of outsourcing this parol-making task! That is, I asked CSC to make parol with the kids, as their craft project. But, as you know, we are all about the food! 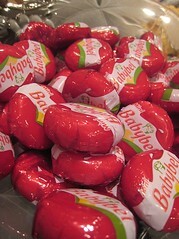 Mini Baby Bels remind us of queso de bola, a round ball of Edam cheese with a waxy red coating, very commonly found during Noche Buena meals in the Philippines. 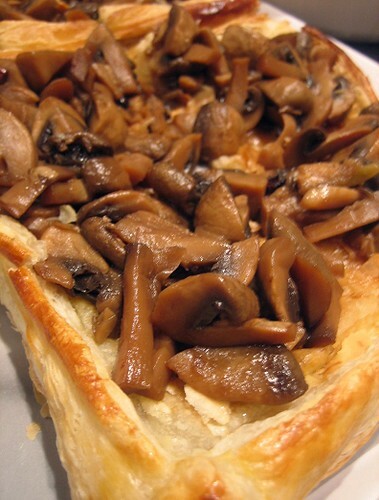 We topped puff pastry with adobo-cooked mushrooms (soy sauce, vinegar, garlic, black peppercorns, bay leaves). Read the post here. This is also a celebration food. 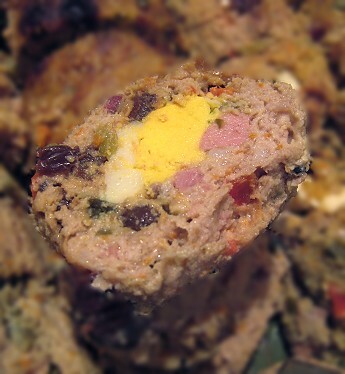 It's a pork "meatloaf" with bell peppers, carrots, onions, raisins, pickle relish (among other things) and stuffed with hardboiled eggs and Vienna sausages. (Yes, another canned food favorite. I tell you we like our canned goods!) Read the post here. We shamelessly ripped this off of the menu at Rekados. 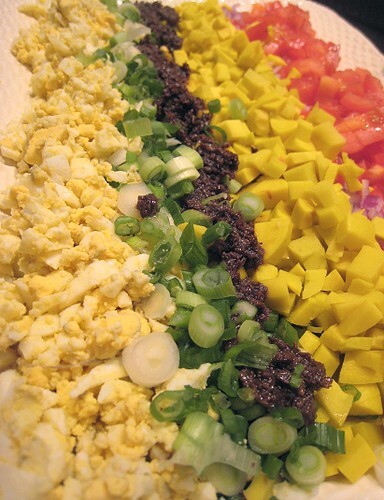 There are five items in this composed salad: pickled mangoes, tomatoes, hardboiled eggs, alliums (red & green onions) and of course, bagoong (shrimp paste). We were especially scared of trying to make this at home! As far as we knew, nobody made this at home. Everybody seems to buy it off a Filipino caterer. But I think we know the secret now! This is a classic Philippine noodle dish made with a seafood sauce colored with achiote, then topped with hardboiled eggs, shrimp, squid, fried pork rinds (yes, pork rinds!) fried tofu, fried garlic, green onions and lemon/lime wedges (for squeezing onto the dish). "Gata" is coconut milk and anything "ginataan" is cooked with coconut milk. 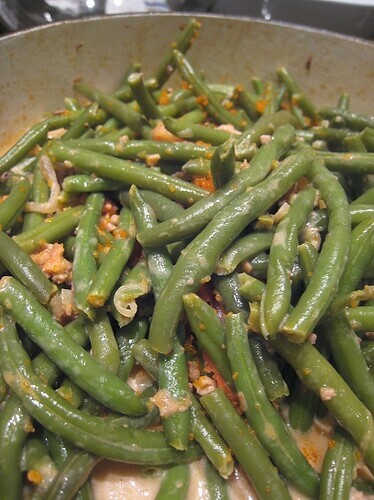 We cooked the green beans in a mixture of coconut milk, some ground pork, garlic, onions, some tomatoes and bagoong (shrimp paste). We added some masago towards the end for that "festive" touch. 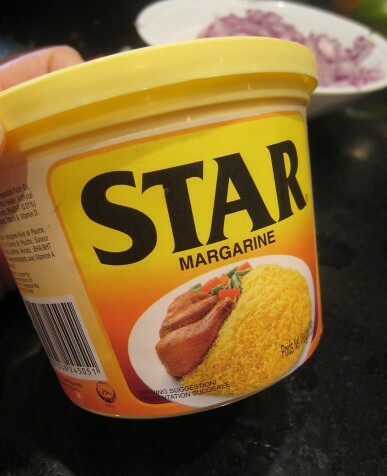 Anybody who grew up in the Philippines knows Star Margarine. We couldn't help giggling when we saw this! 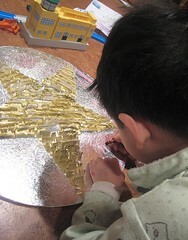 How fortuitous that it's called Star in keeping with our parol theme! We had to get it and make 2 items. 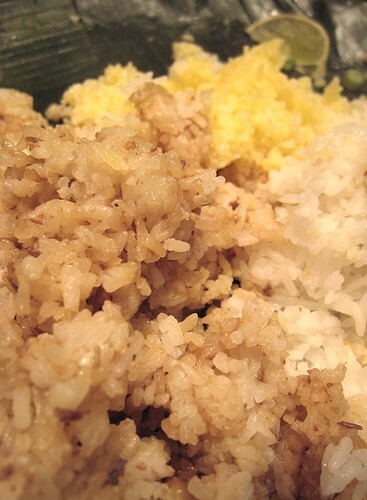 Everyone went for this yellow-hued "Star Rice", remembering the TV commercial where one was supposed to add Star Margarine to rice. We had three kinds of rice. 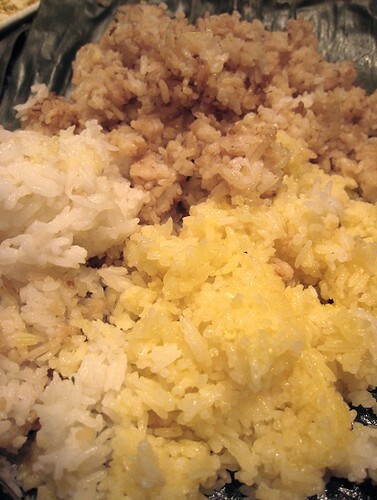 Plain rice, Star Rice above, and rice with some bagoong (shrimp paste) mixed in. We've been subject to Mama's "Chinese Adobo" all these years, so we thought we'd finally put it to use. She makes what she calls "adobo", but in reality, is a soy sauce based dish without vinegar! 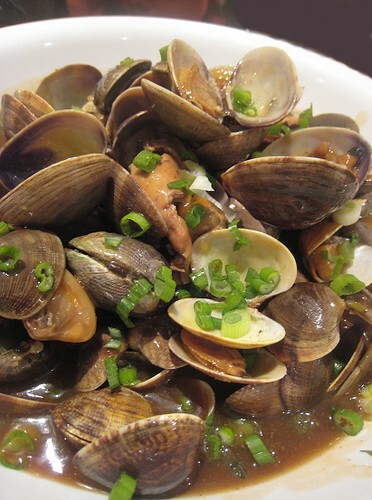 The sauce for the clams and oysters (halaan at talaba) was made with soy sauce, sugar, garlic, ginger and star anise. 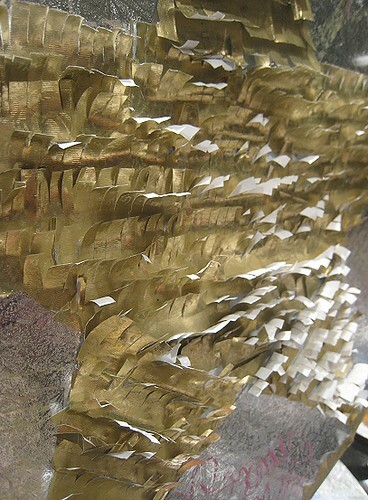 We like to think that the clam chells evoke the capiz shells used frequently to make parol. JS was adamant that the clams be not taken off the menu! 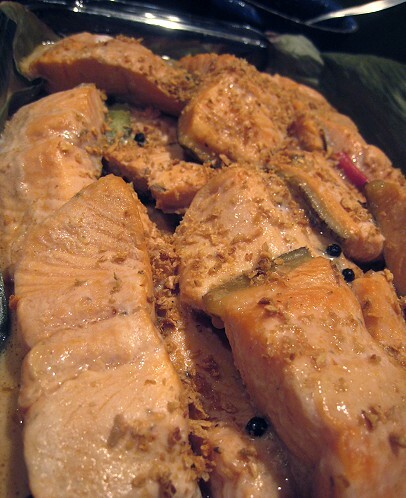 This is a more classic adobo -- soy sauce, vinegar, garlic, black peppercorns, bay leaves -- but with more coconut milk. We paired it with steelhead trout, then topped the dish with fried garlic. We did the same thing as our Christmas turkey, but added five-spice. It had that lovely, familiar, Chinese scent. Read all about our turkey experience here. A classic Filipino way to cook chicken. 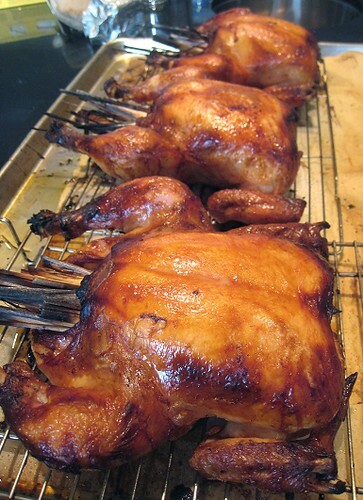 The chickens were marinated in soy sauce and lime juice (traditionally, kalamansi juice). Then, they were stuffed with lemongrass and roasted. Read the post here. Just an aside: Look at this madness! 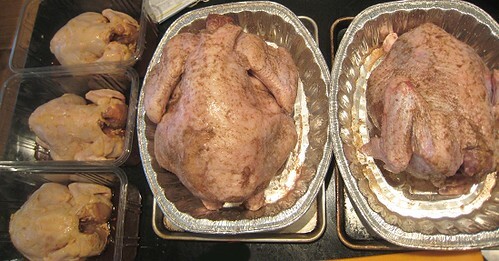 That below are 3 chickens, an 11-pound turkey and a 22-pound turkey! JS wanted to make sure we had turkey leftovers since we were denied that after our Christmas dinner. 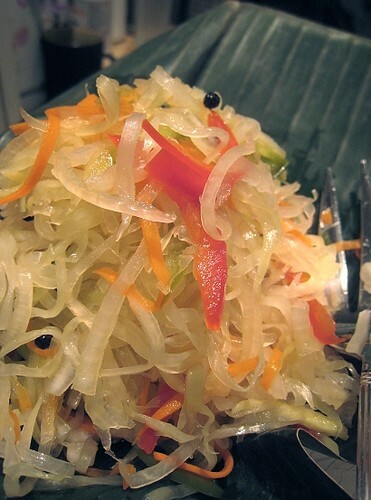 A classic quick pickle made with green papaya, bell peppers, carrots and onions. 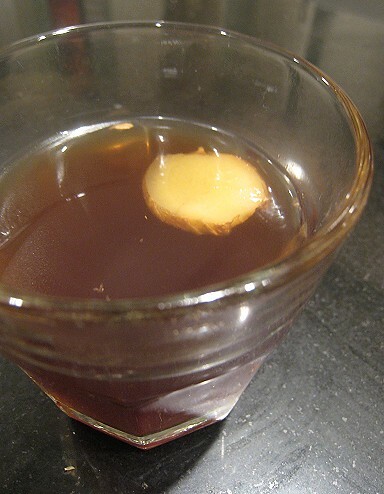 The pickling liquid is flavored with garlic, black peppercorns, ginger and raisins. 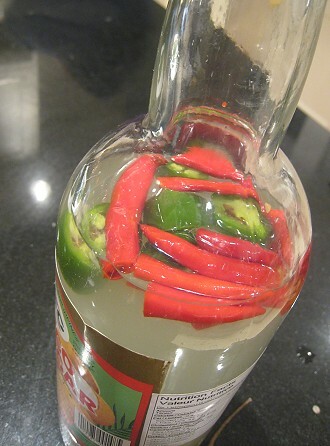 The classic chile-infused vinegar. Perfect with pork rinds, I might add. What else is good with this condiment? 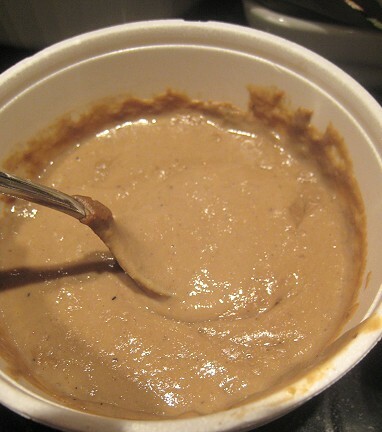 A liver-based sauce to go with Lechon and Lechon Manok. Usually, people would just open up a bottle of Mang Tomas Lechon Sauce. But JS made this from scratch: it's made with livers, onions, garlic, vinegar, black pepper and the very important sugar. Read the post here. 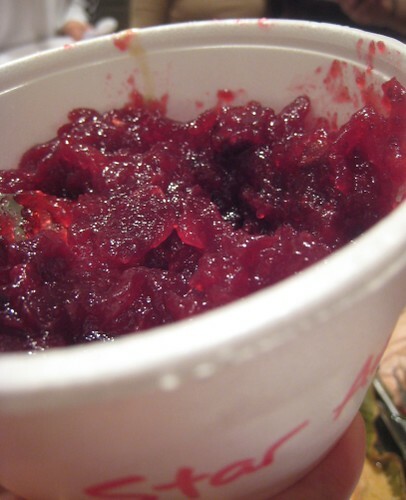 We infused star anise into the simple syrup (sugar & water) before adding cranberries. Think we're done? No! There's still dessert! Purple yam is often used in dessert applications in the Philippines. This is sometimes translated as ube "jam". It's simply ube cooked with sugar and coconut milk (I used coconut milk and cow's milk). 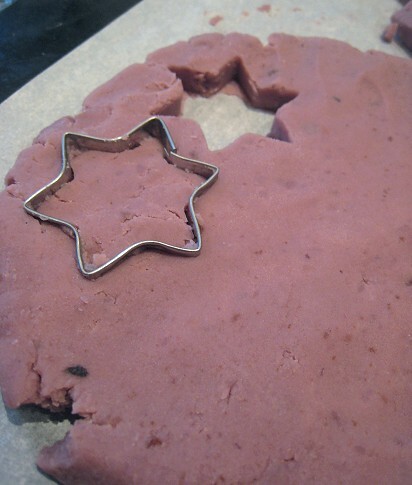 I cut them into star-shapes to decorate my cake. 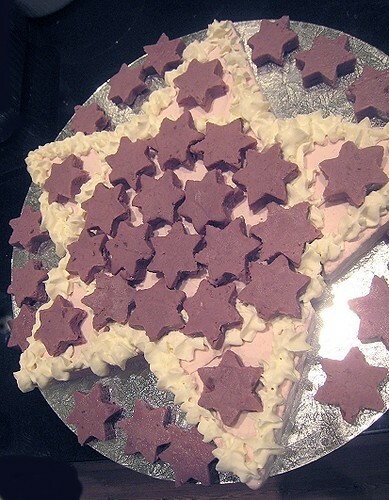 This star-shaped cake was made from ube ice cream, another very popular item. Ube ice cream bought commercially is usually very, very purple, a product of food coloring no doubt. I made this ube ice cream with real ube and the result was a very light purple. I decorated the cake with whipped cream and my star-shaped ube halayan. A showstopper! 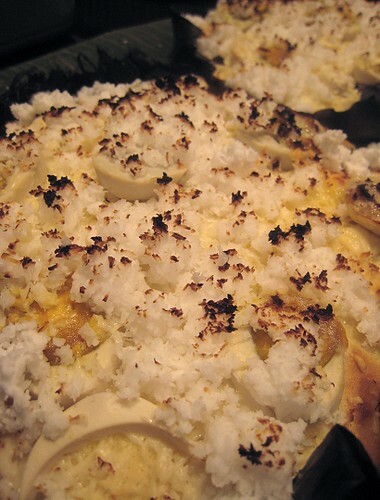 This is a rice cake with coconut milk and cooked in banana leaves, then topped with grated coconut, cheese, and salted duck eggs. We blogged about it here before. We only made two bibingka, but had to make 2 more after dinner because of popular demand! Other guests also brought dessert items like cassava cake and mango pudding. Unwittingly, they brought Philippine-themed items! And finally, to evoke a Philippine Christmas, the heady scent of a hot ginger-infused drink. I infused ginger into water and added brown sugar. This drink is classically associated with the cooler mornings after midnight mass. Patrons would warm themselves with this drink as they leave the church. Read the post here. Whew! That's a lot of food! I think we now realize or remember why we seldom do Filipino-themed dinners for a large party: there is a lot of prep work! Up next, "behind the scenes" of this Starry, Starry Night, because you know preparing for a dinner this size is bound to have some kinks. 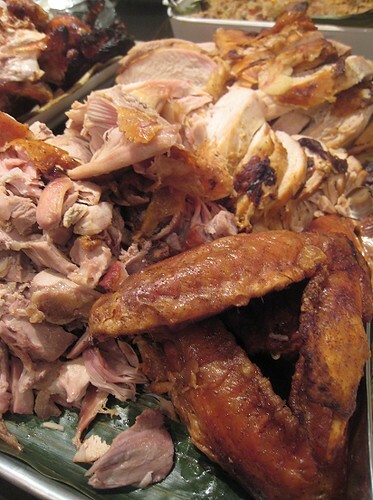 Included will be information on some missing items, like the lechon (roast pig)! And hey, wasn't there supposed to be a pineapple soda of some sort? And more dessert? Also to follow are information on individual dishes, but it may take a few days (or weeks!). This is our quickie post. Mind you, this feast was on New Year's Eve and this post had to be in by New Year's Day! Read Starry, Starry... Pig? here, the story of the lechon for the party. Enjoyed this post? Why not subscribe to [eatingclub] vancouver? Subscribe via reader. Or, subscribe via email. Thanks! You don't need to ask for eaters, I'll gladly fly up to experience all that. Great menu. I don't know if I have room to squeeze in even a fraction of that. I love the capiz shell parol. So pretty! Napaka sarap ng inyong luto! What a great table of eats! Here’s wishing you both a Happy New Year full of more delicious eats. 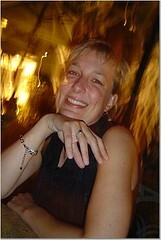 I’m looking forward to future posts from [eatingclub] Vancouver in 2009! You guys are amazing! Can't wait for some recipes. Happy New Year! Oh Lord...this looks like some kinda feast! What a spectacular feast! 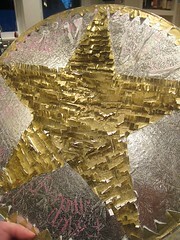 I love that you carried the star theme as far as you could possibly stretch it...bling, bling. And, it's great that the little ones get involved so, hopefully, one day they will pass the tradition on the generation below them. What a great idea! It looks like you had fun doing it, too. Happy New Year! sad that I couldn't be there to participate in this feast! You are awesome, and this menu is awesome. 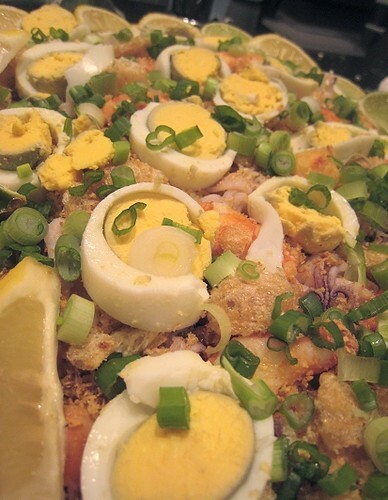 I made palabok too for christmas, it was so popular, my family requested it again for new year's. Awesome menu, great job and wished I was one of your eaters. Happy 2009 TS & JS, looking forward to all your many delicious posts! i *LOVE* ginger tea... it's the only cure for colds (for me, anyway, LOL). anyway, happy new year [ts] & [js]! What an incredible feast. I sure wish I was there to sample. Great job for this event. Bongga kayo 'day! Awesome spread, you guys. 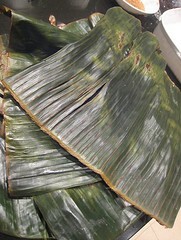 My faves would have to be the embutido (yummmmee), lechon manok of course, and the bibingka. Can't get enough of the sweet-salty goodness! 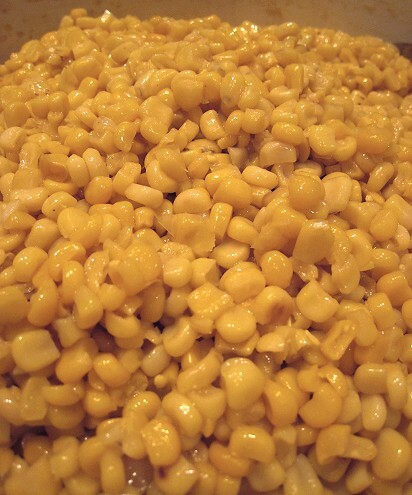 The corn sounds delish too. What's funny is that Star Marg is so far removed from the taste of butter or margarine! It's its own entity! Everything is so tempting! I like Palabok the most! Amazing article as usual! What a nice theme for a dinner. I'm definitely craving some bibingka right now. congrats on the feature, what a feast!! Wow, so much food, a real and great feast! Happy New Year! sorry but i was just too excited!!! oh yes. 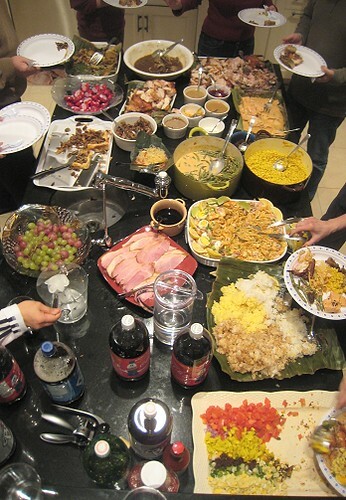 gotta love a filipino feast. and the crushed chicharron on the palabok is key. my favorite! Awww. Actually, I couldn't get all items on one plate. So yeah, perhaps the menu *was* a little *too* extensive. ;D We miss parols! Haven't thought about them much (at all?) until we came up with the theme for the dinner. Thanks! Hope you had a great nea Year's! Thanks. =) We'll be posting about some of these dishes soon. Haha, JS even wante to force every single dish to be some sort of "star" shape! That would really have been a stretch! Ah, the lechon manok! It's very comforting with its familiar fragrance of soy sauce and citrus. Will post about it. Hahahaha... everytime I hear.see BONGGA, I can't help but laugh. Thanks! We were so tired afterwards, actually! Haha. 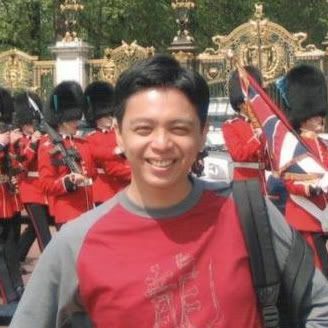 "Bongga ka ;day bongga taas ang kilay!" Is that how that goes? Exactly! That Star margarine has a trans fatty deliciousness all its own! Everybody who had a taste of the rice stopped in their tracks and you can see it in their faces when they realized what that flavor was. Teehee. Haha... it's OK!!! You can use as many excalamtion marks as you want!!! I am that way sometimes too!!! And the good thing is, we ate more chicharron with vinegar after dinner too. Teehee.